The Statue of Liberty has been a symbol of America since 1886, and continues to inspire a sense of freedom and independence in people today. Children can learn about the Statue of Liberty by building a model of the statue out of various materials. Paper mache is created out of flour, water and newspaper, and can be used to create a paper sculpture of the Statue of Liberty. Place a plastic soda bottle upright on a table. Remove the cap. Stuff a ball of aluminum foil into the opening. This will be the head. Tape a pipe cleaner onto the bottle, and curl it into an arch. This will be the lower arm. Tape a craft stick onto the bottle opposite the pipe cleaner, then tape a balled-up tissue paper to the tip of the craft stick. This will be the outstretched arm. Combine 1 cup of water and 1 cup of flour into a pot, and heat it until it bubbles. Remove the mixture and let it cool completely. Tear newspaper into pieces. Dip pieces of the paper into the paper mache mixture, and apply them to the Statue of Liberty structure. Once three layers have been applied, allow the structure to dry completely. Paint the entire structure green. Clay can be molded by hand to create a Statue of Liberty structure. 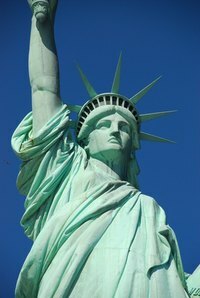 To make a clay Statue of Liberty, knead a ball of clay for about two minutes to remove the air bubbles. Use your fingers to push the clay into cylindrical shape. Create the arms and head, forming the spiked crown on the head piece. Once finished, allow the clay to dry completely, then cover it with a green ceramics glaze. Fire the structure in a kiln. Thin craft wire can be twisted and coiled into a Statue of Liberty shape using needle point pliers. To make a wire Statue of Liberty, coil a wire around until you have created a 4- to 5-inch cylinder. Twist a wire onto the cylinder near the top. Twist the attached wire into a tight coil, then bend it towards the cylinder. This will be the lower arm. Twist a wire onto the cylinder near the top, opposite the lower arm. Coil the wire tightly with the pliers, then raise it upward. This will be the upper arm. Twist a wire onto the structure on top of the cylinder. Coil the wire with pliers to make the head of the structure. Attach a wire to the head, and use the pliers to create the spiked crown.